Designed to be both portable with a built in carry handle or rack-mountable with half-rack wide 2RU high dimensions, Ki Pro Ultra suits a wide range of production and post environments. Big on quality - but not on file size. of Apple ProRes® including Apple ProRes 4444. This lets you choose the balance of image fidelity and file size that’s right for each individual production as well as having the flexibility to record directly to native file formats that are understood by most major editing systems. 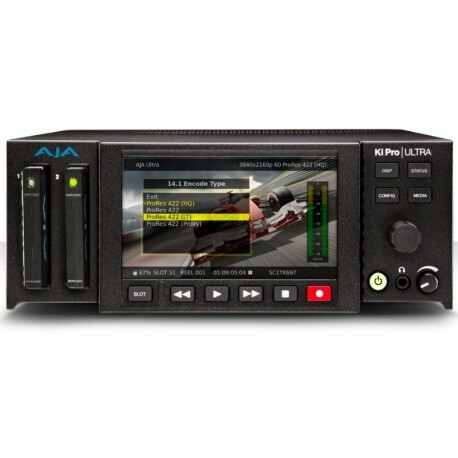 Ki Pro Ultra captures directly to rugged and reliable AJA Pak SSD media. Pak media is available in a variety of capacities to best suit the demands of your production. Pak1000 is the perfect companion for Ki Pro Ultra offering 1TB of fast SSD media for up to 4K recording at 60p in ProRes HQ. Ki Pro Ultra also offers compatibility with Pak512 and Pak256 media, ideal for lower frame rate projetcs. Pak media may also be used with the optional Pak Dock which features USB3 and Thunderbolt™ connectors for lightning-fast data transfers from and to your desktop or laptop. Ki Pro Ultra features a beautiful high-resolution HD display for pristine monitoring of your material, and serves as your interface to Ki Pro's familiar and intuitive menu system. The detailed overlay UI includes onscreen keyboard functionality and a clear view of the powerful yet simple to operate UI, all pristinely presented on the 4.8” 720p LCD display. The large LCD provides detailed playback and monitoring perfect for onset use, the O.B truck, helicopter or studio and it’s transparent menu overlays can be set at just the level the user prefers. Ki Pro Ultra offers control over brightness of the display for flexible control to suit your working environment. Anyone familiar with the operation of a tape deck will feel immediately comfortable when working with Ki Pro Ultra. 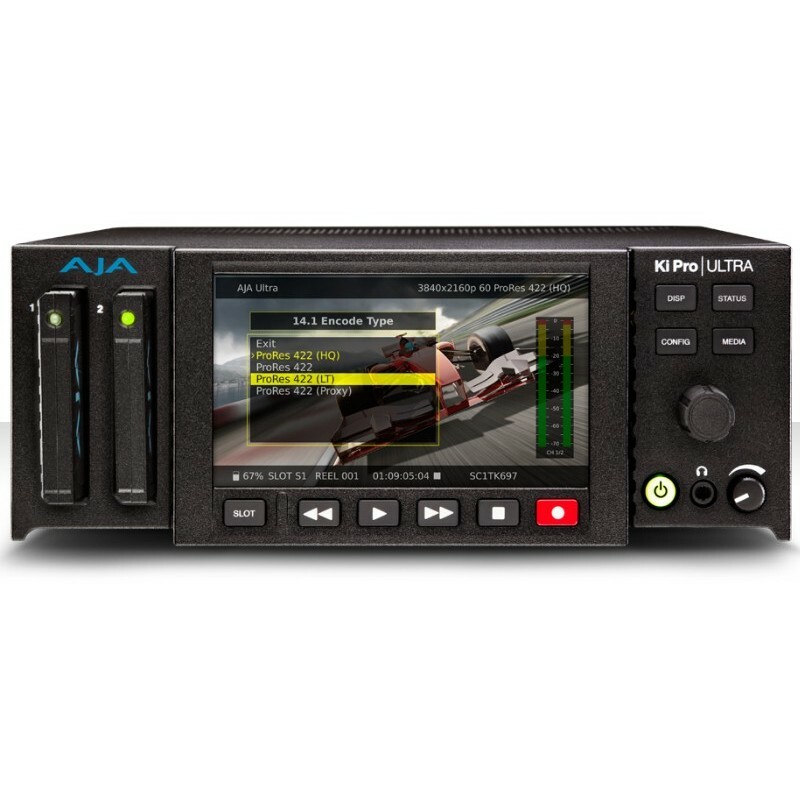 Just like a traditional tape deck, Ki Pro Ultra features straightforward and dedicated transport buttons - record, play, stop, rewind, fast forward - making the device easy to operate with minimal training time. The current status of the system and key configuration information is clearly displayed on the beauticul built-in high-resolution LCD screen. Additional operational information can be found in the STATUS menu which can be accessed even when recording or playing back. The Ki Pro Ultra operating system offers users a logical menu structure that is easy to navigate with menu parameters presented in clear and understandable language. 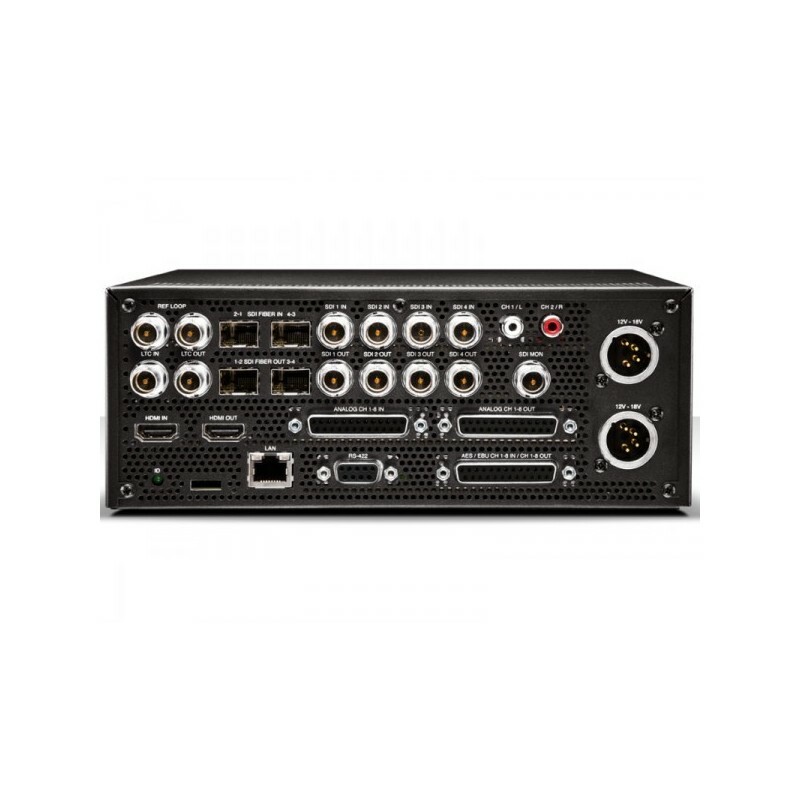 The video and audio connections on the rear panel of the Ki Pro Ultra offer next generation connectivity with 3G-SDI, Fiber and HDMI inputs and outputs, AES and analog XLR balanced audio, LTC, RS-422 and LAN. Ki Pro Ultra provides full resolution outputs for 4K, UltraHD and HD over 3G-SDI, FIber and HDMI, including the latest affordable UltraHD monitors using HDMI for on-set quality checks. An additional dedicated 2K and HD-SDI monitor output can be fed to any affordable and existing HD-SDI display. Ki Pro Ultra’s fully integrated fiber inputs and outputs means Ki Pro Ultra can be integrated directly to a dedicated fiber network alongside many other fiber products. Fiber allows outgoing and incoming video signals to be transmited as far as 10km away. The optional fiber inputs and outputs let you to choose from multiple wavelength CWDM SFPs, allowing advanced multiplexing of signals over a single fiber connection. RS-422 control allows Ki Pro Ultra to integrate easily with supported editing systems and external controllers allowing it to fulfill several of the functions of a traditional VTR. Supported NLEs can even perform assemble edits directly to the Ki Pro Ultra. In a truck or a machine room, Ki Pro Ultra is equipped for advanced remote control and configuration. With a standard Ethernet LAN connection to a host computer and any web browser, all Ki Pro Ultra parameter settings, clip selection and transport controls can be controlled; no additional or special software installation is required on the host computer. Multiple Ki Pro Ultra units can even be controlled from a single web interface making Ki Pro Ultra an ideal solution for multi-camera recordings. Note: the AJA Data Rate Calculator is provided as part of the system installation for all KONA cards, Io Express, and the Io HD.